According to the National Center for Women and Information Technology, although women make up over 50% the American workforce, they occupy only about 25% of computing and technology jobs. If you work in the tech industry, these numbers are no surprise. But you’re also probably aware of countless initiatives to correct the gender imbalance. Recently, Facebook and Apple made headlines by adding egg-freezing to their already long lists of perks meant to keep women in the tech workforce (debate ensued). In recent years, organizations like Women Who Code and Girl Develop It have been teaching women to code. At home, more parents are making new efforts, one way or another, to encourage their daughters to pursue computer science. But the question remains: is anything changing? As Viget’s internship program coordinator, I’ve had the impression that we’ve seen more female Front-End Developer applicants in the past year or so. I decided to look at our internship recruiting data to see if my impression was correct. The data then prompted me to ask some of the women in our web developer network for their thoughts on working in tech. My most significant takeaway: while the numbers are critical, it’s important to analyze them in the context of culture. *Here’s more information about trends in our total application volume. 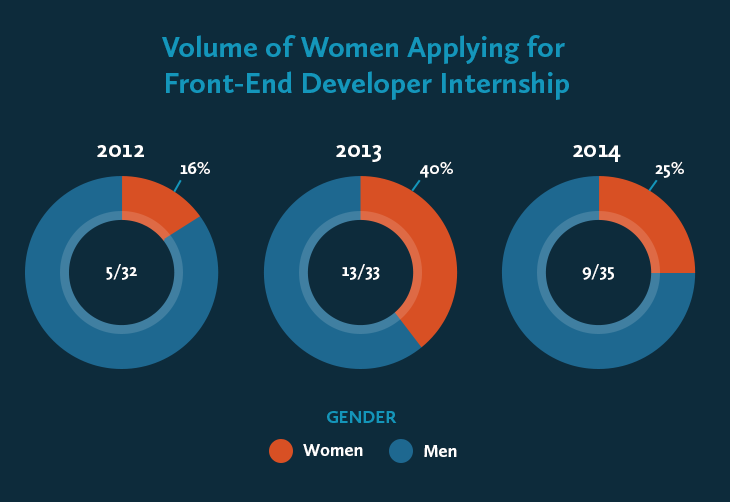 For the Front-End Developer Internship, in particular, 2013 was our best year in terms of the volume of women applying. That volume fell from almost half of all FED applicants to about a quarter of all FED applicants in 2014, and we’re not sure why. 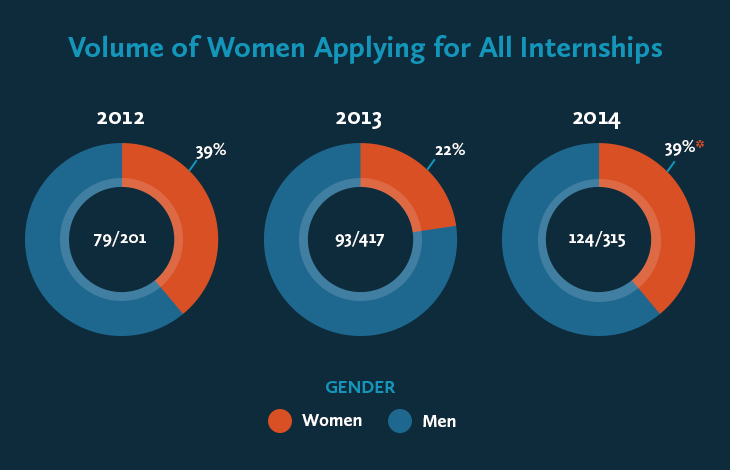 But it’s also worth noting that, in 2013 and 2014, our combined total of four Front-End Developer interns were women, including Una Kravets (now working as a Front-End Developer at IBM Design) and Helen Holmes (who leads DC’s chapter of Women Who Code and works as a Front-End Developer at Capital One Digital). We’re thrilled to have them as part of our growing community of intern alums and eager to help them build their careers over time. We’re also proud that, earlier this year, we hired our first full-time female Front-End Developer, Megan Zlock. One way that companies, including Viget, try to help is by partnering with local elementary schools. 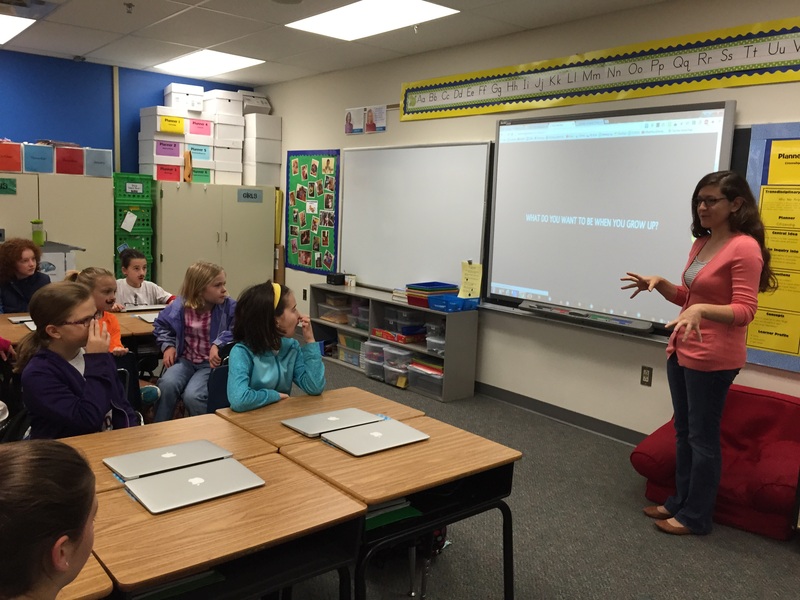 Megan recently joined Viget Project Managers Amanda Ruehlen and Grace Canfield at an elementary school to teach an all-girls STEM club about careers in tech. “I was really excited to see them trying out Scratch,” says Megan, “It’s an educational tool made by MIT, which introduces the logic concepts behind coding. They had a lot of fun adding their own voices and using the characters built into the tool to make their own little animations and scenes." Unsurprisingly, what was meant to be a quick glimpse at our recruiting data has become a conversation about culture, education, and gender norms. On the culture front, I’m proud that Una offered two thoughts on what she thinks Viget’s internship program gets right: the fact that each intern gets an Advisor, “meaning I always had someone to turn to with any problems or questions”; and our company-wide culture of learning and teaching, which “decreases the barriers to asking questions, making someone feel less self-conscious about potentially asking a ‘stupid question.’ ” Interestingly, what Una describes as an especially woman-friendly environment is just the type of learning environment that all of us at Viget strive to provide for each other, regardless of gender. As I worked on this post, I kept hearing a note of caution from our intern alums and current FEDs alike: let’s not offer false optimism. I agree. Right now, Viget has one full-time female front-end developer on a team of eleven. There are no quick fixes for the gender disparity—whether we’re talking about a single company, the tech industry, or our culture in the largest sense—and mere jingoism doesn’t help. Here at Viget, we’re committed to making progress by participating locally in efforts that help educate girls and women about tech, as well as by fostering a learning culture that enables all of us to thrive, including women. We’re eager to see who our next crop of FED interns will be. We’re cautiously optimistic that we’ll hear from more women in the coming years (and, as always, we’ll be tracking the numbers). But, ultimately, we’d love to hear from all aspiring web developers, regardless of gender. We’re now accepting applications for our Summer 2015 FED Internship, and we hope you’ll apply.